I’ve always been impressed with the Beaver Class A (now Monaco) cabinetry and joinery. In looking in the towable world I’ve never found a manufacturer who could match their work - most likely due to the additional weight that would be involved with that level of woodworking. The DRV models seem to be the exception. We’ve walked through a few DRVs and I’ve looked it over, but don’t have any experience with how well it holds up over time. Is all the cabinetry real wood (i.e. not OSB, particle board, etc.)? For example the base around the island in the kitchen - real wood? I know in my Grand Design 313RLTS the base is fake wood; bump the vacuum cleaner up against it and you see it chips easily. We haven't had ours long enough for me to think about our cabinets, but when I get a chance I'll try to remember to check them out. All of our TT were not real wood. This link is a short but good video made by a 3rd party at the DRV Plant. Around 1:57 and 2:10 you can see closeup shot of the kitchen and other cabinets. It mentions the cabinets are made in an outside plant. During our tour of the MH plants in Wakarusa, they mentioned a separate plant operated by an Amish Community that makes all the cabinets for their units. I would bet it's the same or very similar group...the cabinets in the DRV's look like real wood vs. toy airplane crap like in most trailers. I also was impressed how the aluminum framing is bolted together vs. welded. Wife and I are in the video, we became friends with the couple doing the video. The guy in the orange shirt giving the tour did NOT have a clue!!! On our Mobile Suite, some of the trim around the slide outs is a veneer and not solid. All the cabinet doors and stiles are solid wood. The cabinets and doors are wood. The quality is about what you would expect when speed over craftsmanship is desired. There was a time when “Amish built” was synonymous with quality. I was recently at the Howe service center (trailer was there for 7 weeks). 44 cabinet doors were replaced and one closet door. At least 2 of the new doors are warped, not sitting flat. Closet door should have been replaced as pair. Two different colors, two different grains and on the new door the raised panel is warped. Fast constructions, maybe without clamps. Many areas where the adjoining wood parts are not flush. Drawer slides are low quality. Garbage can drawer slides were replaced (don’t know why, I had already replaced them). The are a cheap part. The new garbage drawer slides failed today, 1 week. Sitting in my recliner right now looking at the row of drawers next to the TV. All three drawers are not parallel to each other. Maybe DRV doesn't contract with the Amish builders...of the variety of issues owners have with the MH's, you rarely hear of a significant cabinet issue. 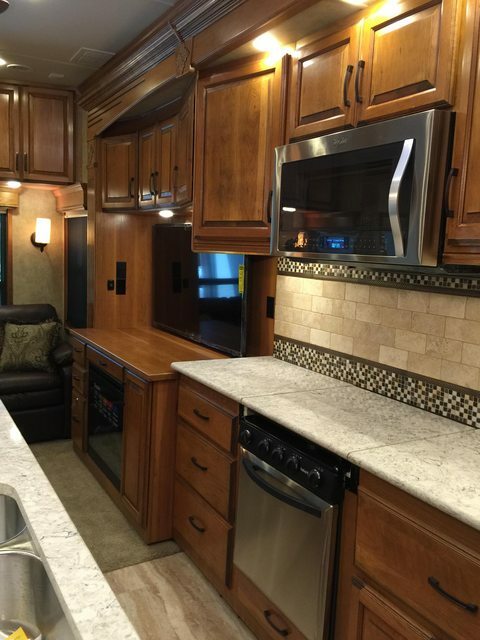 For beautifully made cabinetry in a 5th wheel take a look at a Lifestyle Luxury RV. Finish is excellent, cabinets are square and all solid wood including the bottoms. Exquisite. Can you post some pictures of them for us? I tried to post some from my phone but it won't let me. I'll see if I can post from a computer. Rig is 4 yrs old. Previous owners lived in it full time. The finish still looks new. It was a nice surprise to see that even the inside of the cabinets are neatly joined and caulked. All drawers are soft close. Very nicely done. Hasn't Lifestyle changed owners in last 4 years? Our DRV with Elite wood trim package. 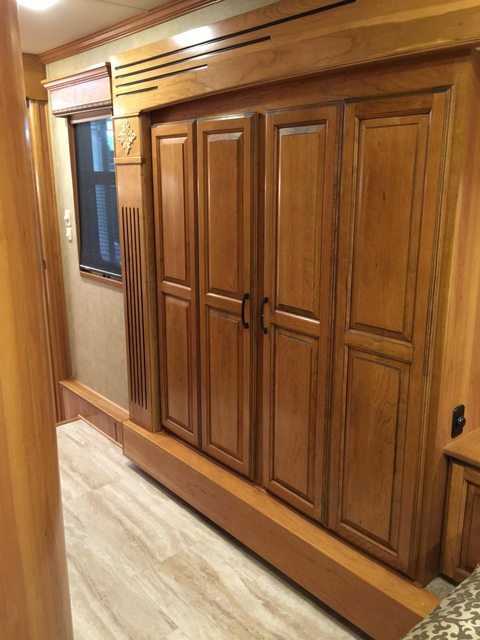 Wood trim and cabinetry is nice, there is a couple spots that are not square. In general it's as good as it gets unless you are looking at a BEAVER/CountryCoach for example. anyone else ever camped in a van down by the river>??? where you built a bed in the back with a hand saw and a drill??? put a foam mattress and an a sleeping bag... and loved ever minute of it ??? ?